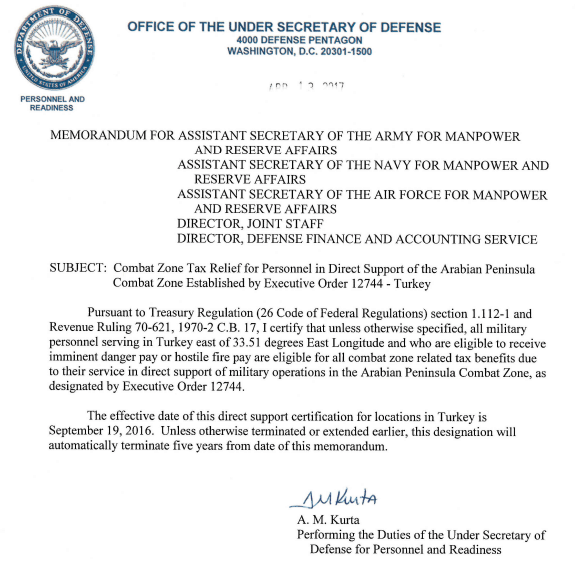 Effective September 19, 2016, unless otherwise specified, all military personnel serving in Turkey east of 33.51 degrees East Longitude who are in direct support of military operations in the Arabian Peninsula Combat Zone and who are eligible to receive imminent danger pay or hostile fire pay are eligible for combat zone tax benefits. If you served in this area, your taxes will be adjusted, and if applicable, you will receive a 2016 corrected W-2 form (W-2c) and/or a refund of applicable 2017 taxes that were already withheld. 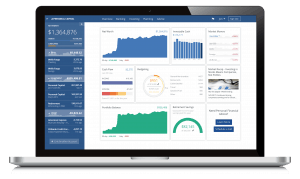 Additionally, deferred TSP contributions will be re-categorized as exempt. If you do not receive a W-2C and believe you should have, please contact your finance office. Please see your finance office for further information. This is great news for any troops TDY, deployed, or stationed in Turkey. Affected areas should include Diyarbakir and Incirlik Air Base. I have not seen any reimbursement or a corrected W-2 (W-2C) but I should be receiving reimbursement for one month this year. Pursuant to Treasury Regulation (26 Code of Federal Regulations) section 1.112-1 and Revenue Ruling 70-621, 1970-2 C.B. 17, I certify that unless otherwise specified, all military personnel serving in Turkey east of 33.51 degrees East Longitude and who are eligible to receive imminent danger pay or hostile fire pay are eligbile for all combat zone related tax benefits due to their service in direct support of militar yoperation sin the Arabian Peninsula Combat Zone, as designated by Executive Order 12744. The effective date of this direct support certification for locations in Turkey is September 19, 2016. Unless otherwise terminated or extended earlier, this designation will automatically terminate five years from the date of this memorandum. Has anyone been able to open an SDP account while stationed in Turkey? Also, here are a few ways to save money while deployed. And here's some ideas on how to make your deployed the most financial beneficial month, six months, or year+ of your life. Also, going forward, if you are in Turkey getting CZTE pay, make sure you are taking advantage of making tax free contributions to your Roth TSP and Roth IRAs. 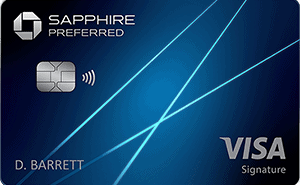 Let me know if you have any issues with this process or if you get your W-2C or refund in the comments. Any word on whether they will extend it earlier? I was deployed there until July 2016.